Very few have the fortune of pursuing exactly what their heart desires professionally. 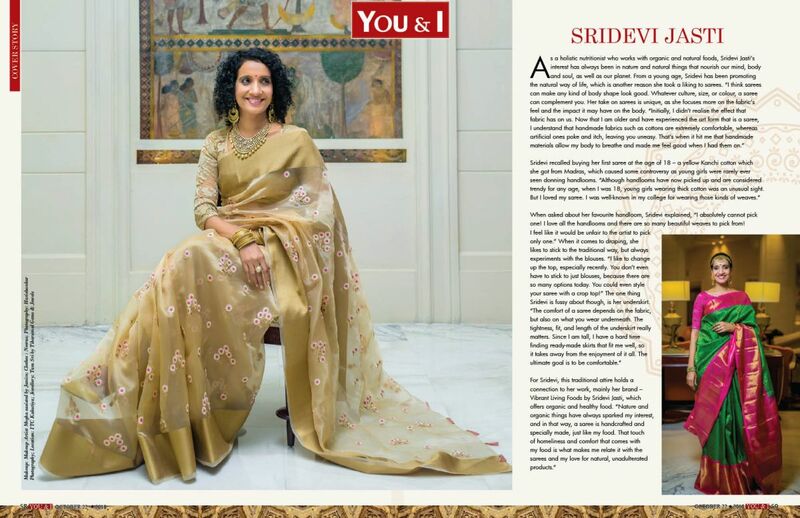 But Padma Somireddy, founder and chief designer of Divine Designs, is an achiever who decided to step out of her successful IT career to explore her passion: interior design. She believes people should be confident and engage in the fields that bring them joy, explaining, “Your education skills don’t have to define you. Organisation, communication skills, dedication, and management style play a bigger role than education, when managing a company.” Her attention to detail and extraordinary sense of style have helped her accomplish numerous projects with flying colours. On the family front, Padma is blessed with two sons and a loving husband. A fitness enthusiast and a classical dancer, Padma aims to enter the fashion industry as well. 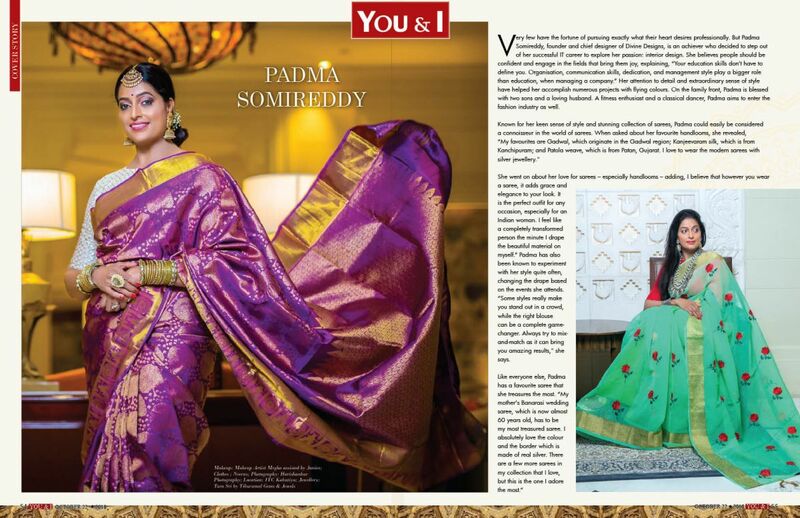 Known for her keen sense of style and stunning collection of sarees, Padma could easily be considered a connoisseur in the world of sarees. 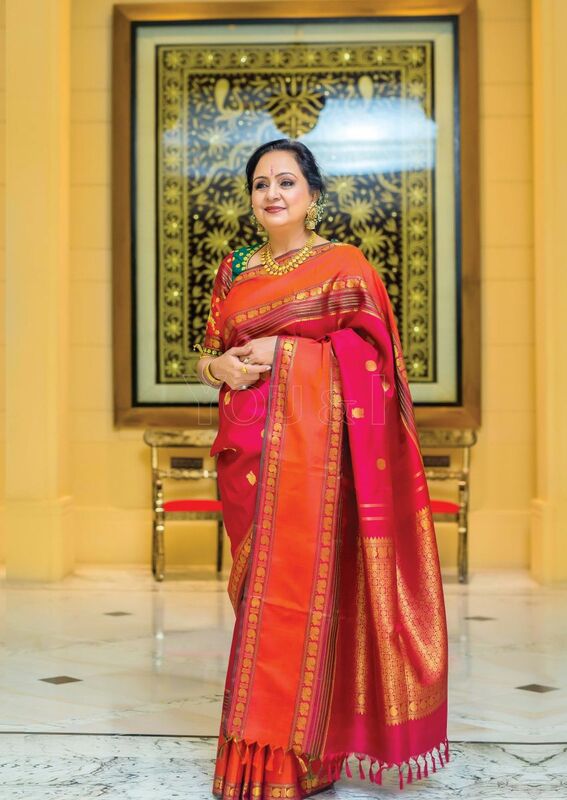 When asked about her favourite handlooms, she revealed, “My favourites are Gadwal, which originate in the Gadwal region; Kanjeevaram silk, which is from Kanchipuram; and Patola weave, which is from Patan, Gujarat. I love to wear the modern sarees with silver jewellery." 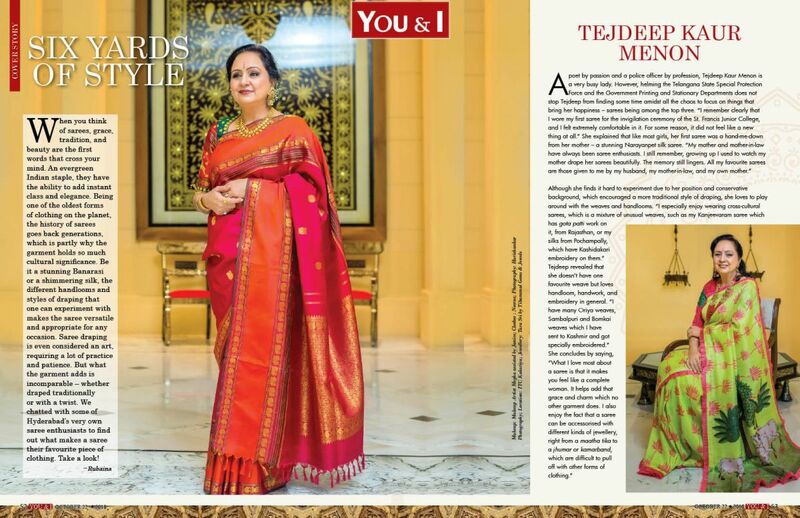 She went on about her love for sarees – especially handlooms – adding, I believe that however you wear a saree, it adds grace and elegance to your look. It is the perfect outfit for any occasion, especially for an Indian woman. 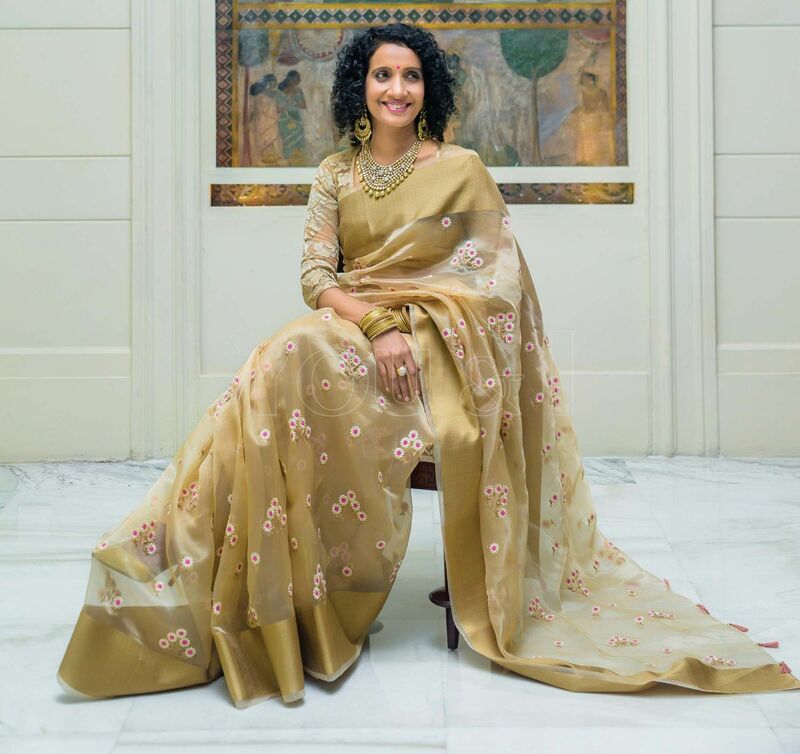 I feel like a completely transformed person the minute I drape the beautiful material on myself.” Padma has also been known to experiment with her style quite often, changing the drape based on the events she attends. “Some styles really make you stand out in a crowd, while the right blouse can be a complete game-changer. Always try to mix-and-match as it can bring you amazing results," she says. An image and etiquette consultant, co-founder of Chatterati, and a consultant with Concern India Foundation, Priya Rajiv has her hands full. 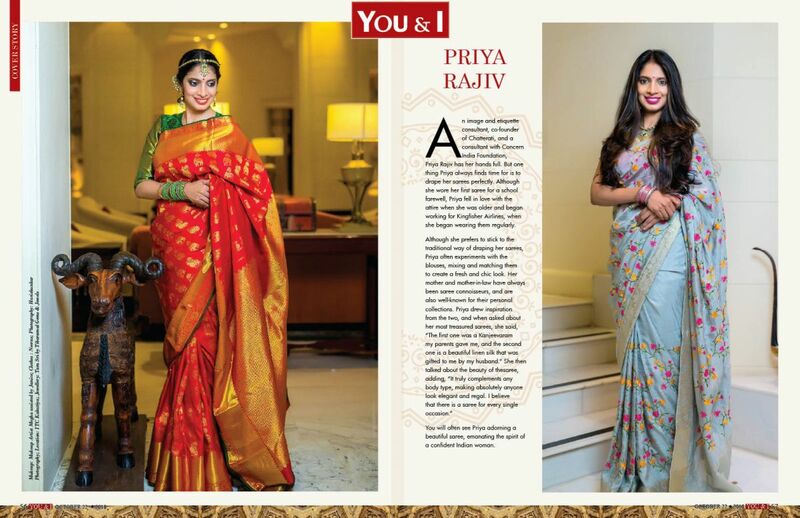 But one thing Priya always finds time for is to drape her sarees perfectly. Although she wore her first saree for a school farewell, Priya fell in love with the attire when she was older and began working for Kingfisher Airlines, when she began wearing them regularly. You will often see Priya adorning a beautiful saree, emanating the spirit of a confident Indian woman. When asked about her favourite handloom, Sridevi explained, “I absolutely cannot pick one! I love all the handlooms and there are so many beautiful weaves to pick from!